The next step is to profile the garage floor after the concrete is properly cleaned. The process of profiling involves exposing any pores in the concrete’s surface so that the epoxy can make a good bond by flowing into them. This is the most crucial step of garage floor preparation. To achieve the proper profile, you can choose to either acid etch or grind the garage surface. A proper acid etch is sufficient for most applications, but most epoxy manufacturers and professional installers prefer to grind the floor compared to acid etch. The surface has to be properly vacuumed after grinding. If your finger tips are white after running them over the concrete, this will mean that there is still dust and the floor has to be vacuumed again. If you decide to use acid etch, make sure that before applying the epoxy, the floor had enough time to dry completely. 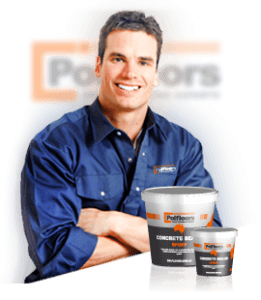 If you apply it too early, the released moisture can cause delamination or create air bubbles. The floor may need a minimum of 24 to 48 hours to dry completely, unless you are using a water based epoxy that can be applied on a damp floor for the first coat. Drying may take longer if the weather is humid. Fans can be used to speed up the process. Tip: Applying the first coat of epoxy in the late afternoon or early evening, after the temperatures start falling, is a good way to diminish the risk of air bubbles. Also be mindful, that moisture is driven deeper into the concrete if you use pressure washers. This moisture will require more time to dry out.